Bring Erie County, PA history to you! Out of the Box is an exciting series of traveling resource trunks created for teachers, youth group leaders, museums, libraries, and others looking for unique and educational ways to share the rich heritage of Erie County, PA with others. Each trunk focuses on a specific topic in Erie County history and contains reproductions of historical artifacts, primary source documents or photographs. This is a great way for students to learn historical thinking skills, practice asking questions about the past, study history from multiple-perspectives, and share their knowledge through creative activities. The trunks have suggested grade levels but may be used with any age group. Click here to download a brochure describing trunk themes and information on how to borrow them. All Aboard! (Grades 3 – 5) – This trunk contains two lessons. Students will gain an appreciation for the development of the railway by determining a specified length of track and computing how many spikes were necessary to complete the section of rail. Maps, rulers, and miniature ties and rails are included. The technology lesson details the steps necessary to complete a digital display of pertinent information about the Climax Locomotive. A CD of photographs and informative text is included. Climax Locomotive (Grades K & 1) – Students will place lowercase letters wheels to its uppercase match on a train; identify differences and similarities of the Climax locomotive located at the Corry Area Historical Society’s museum and other trains; use concrete representation to solve addition and subtraction problems by taking a ride on the “Math Train” throughout the classroom; and learn basic shapes in order to create a train based on the Climax Engine. Home of the Climax Engine and the Railroad Experience (Grade 3 – 5) – Students will compare and contrast three maps (1870, 1895, and 2011) on a Venn diagram as well as creating their own map; design and build their own signaling device and use it to send messages; and sort items into two categories (containing oil, not containing oil) and then build an oil derrick. There is also a listening center for discovering what working on an oil field sounds like. To borrow a trunk, go to www.tinyurl.com/allaboardtrunk. Corry Area Historical Society, Inc. will contact you to make further arrangements. Dr. Helen M. Daggett Pollay Weeks, An Extraordinary 19th Century Woman (Grades 7 – 12) – With this trunk, students will learn about Fairview native Dr. Helen M. Daggett Pollay Weeks, a woman who rose above 19th century gender stereotypes to have success as a poet and author, physician and reformist. The trunk contains reproductions of historical artifacts, primary source documents or photographs. Our suggested grade levels for this trunk are Grades 7-12 but it may be used with any age group. Creating a Time Capsule (Grades K – 12) – The container that holds the materials is a miniature model of the actual time capsule that was buried at The Little Church on the Hill by the Elk Creek Township Historical Society. Feel free to use this container as a part of the lesson. The purpose of this trunk is to teach students about how time changes. Time Capsules and Tornados, Newspapers and Nickels (Grades 2- 8) – “What’s in a Time Capsule” is aligned to 8th grade, focusing on teaching how history influences the present. “Tornado Experiment” is aligned for grades 3 – 8, and introduces hands-on experimentation with tornados and tornado safety. “Inflation of a Dollar” is aligned for 2nd grade and explores the inflation of the dollar from 1855 to today. “Features of a Front Page Newspaper” is aligned for 6th grade and explores finding important information within a newspaper article. The Dodge’s: A Look at Life in Harborcreek (Grades 6 – 12) – This trunk takes students back to 1869. Students will read primary documents in the form of family letters and journal entries. Students will investigate how language evolves and changes over time. Students will be able to analyze, compare/contrast and interpret daily activities, decisions and personal thoughts of the neighbors in the Village of Harborcreek. The Gauge War (Grade 3) – This trunk has students delving into the reasons behind the “Gauge War and the commercial reasons that it occurred. Students will also understand the correlation between distances on a map and actual distances. Understanding Family History (Grades 3 – 5) – This trunk was developed for students with non-traditional families. Items in the trunk include representations of three dimensional old-time toys and household items, and photographs of people from different ethnic backgrounds and ages. These things can inspire discussions of “family” relationships. Genealogy (Various Grades) – The trunk was compiled by Edinboro University Students. It includes lessons for explaining what genealogy is, understanding probability and genetics, and mapping migration routes. Spencerian Script Penmanship Kit (Grades 3 – 5) – Hornby School Museum preserves a one-room school of the 1880s. At that time people learned to write in an embellished cursive style such as Spencerian script. Youngsters practiced on lined sheets using pencils until they were skilled enough to use pen styluses with removable nibs that they dipped into inkwells. The trunk contains pencils, a guidebook on how to form letters, masters of the lined practice sheets that teachers may duplicate in any number, and samples of cursive writing to read or copy. Students practice their own cursive signatures or practice cursive writing in other contexts. To practice using the stylus, pen nibs, and ink, consider scheduling a visit to Hornby School. Out of the Box is a multi-stage project culminating in the production and promotion of Erie County history curriculum resource kits. The purpose of Out of the Box is to create resources to improve educators’ comfort in teaching local history and help students explore the history of Erie County. 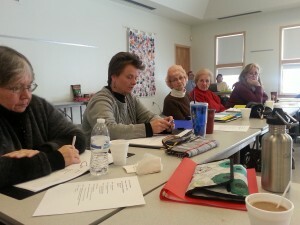 Several local historical societies and museums participate in the Out of the Box project, which began in February 2012. The project is in partnership with Edinboro University of Pennsylvnia’s History, Anthropology and World Languages Department and College of Education, and is supported in part through funding from The Erie Community Foundation.